red and rare steak, fresh white and seafood, cheese and wine. We often forget vegetable or vegan-friendly pairings but there are many delicious options. In this article I outline my 10 best vegan wine and food pairings from last year. 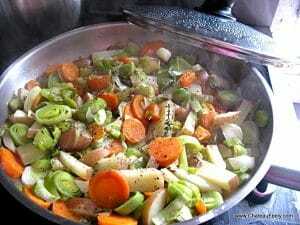 Family Feely is not vegan but we only eat organic, are ecologically-minded and eat a lot of vegetarian. That, and a nudge from a vegan friend Debbie Barazetti, were the catalyst for this post. One evening in the summer Debbie and Jon brought a selection of vegan dishes and I proposed a selection of our wines. It was a fun and helped me conceive the vegan pairings for our wine and food pairing lunch and half day wine tour . It’s worth mentioning that not all wine is vegetarian or vegan friendly. Wines are often fined (clarified) with egg white or isinglass, a fish collagen. All Feely wines are vegan friendly and certified organic. My top ten vegan pairings have also been inspired by the fabulous Happy Pear cookbook (A must have – it took my cooking to a seriously higher level – and if you read my books you know it needed lifting 🙂 ). 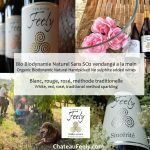 I suggest Feely organic biodynamic natural wine (shameless self promotion- we do ship to most of the EU – case prices including shipping here) but if you have to source alternatives then look for the organic sign and ‘vegan friendly’. Melon straight up (the orange kind) and pure semillon that is at least three years old (Silex). Simple and delicious. Freshly picked courgette finely mandolin sliced and marinated in lemon juice and olive oil for at least 15 minutes – with a moderate climate, pure sauvignon blanc (Sincerite) – the almost pea / asparagus of fresh picked courgette and the lemon go so well with sauv blanc. Yum. (it could work with a sauv blanc sem blend like Luminosite too). This is a good example of the reinforcing the flavours in the food with the aromas/ flavours in the wine to create a successful pairing. Orange, fennel, rocket and red onion salad with mustard, orange juice and olive oil dressing paired with a natural sauvignon blanc semillon blend (Luminosite) or for red lovers a no sulfite St Emilion style blend with hints of orange peel and dark fruit on the nose (La Source). This shows how some foods can successfully pair with red and white. 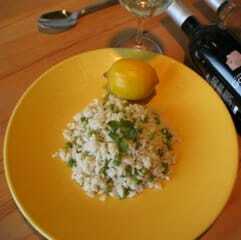 Pea and lemon risotto with pure sauvignon blanc (Sincerite ). Summer chickpea salad (chickpeas, onion, basil and tomato with chilli) and a spicy no sulfite added cabernet sauvignon (Vérité) or malbec. These vegan wine and food pairings are delicious and healthy. See part one of our series on general wine and food pairing. 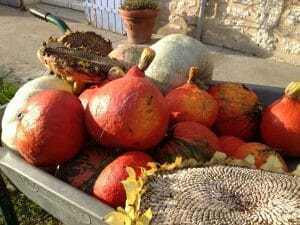 Also check out Caros top ten why celebrate supporting organic farming and three big reasons to choose organic wine. Happy reading, cooking and tasting!